Martha Verleyen (º1993) studied Art History (KU Leuven) and graduated in 2017 with a master’s thesis about lace and its meaning. After her studies in Leuven she went to Paris to learn embroidery techniques at École Lesage. The practice of embroidery, and manual textile production in general, is her main inspiration to understand textiles. 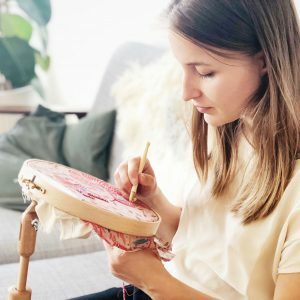 For her theoretical frame, she explores art history, anthropology, philosophy, sociology and sometimes even botany among others to find notions about textile.